Halloween is nearly here, and I imagine if you are like me- you likely have to make a treat to send in to school with your youngster. 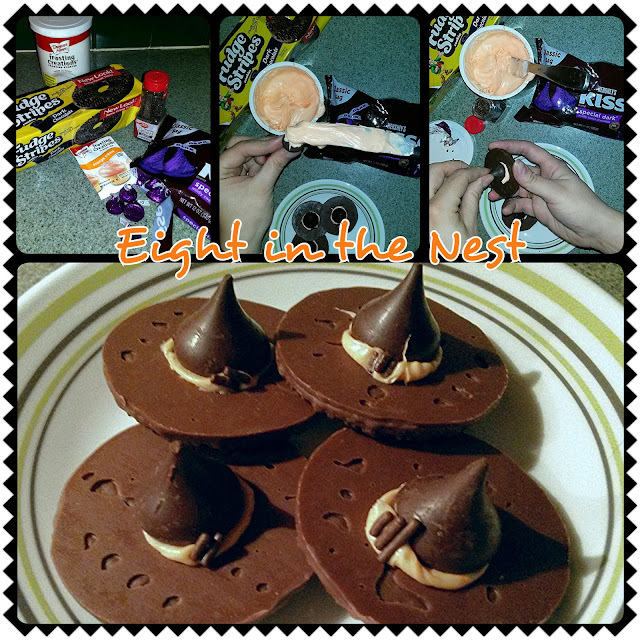 Tonight I made some VERY easy treats that are fun and festive! I saw the idea floating around Pinterest and Facebook, so I figured I would try! I used Fudge Stripe cookies, dark chocolate Hershey Kisses and Duncan Hines frosting, and some sprinkles. Flip over the Fudge Stripe cookie, apply a bit of frosting to the underside of the Hershey Kiss, place over the hole in the cookie and press down. the frosting will seal the Kiss to the cookie and create a ribbon-like look. I then added sprinkles to resemble the "buckle" on some witches' hats. These really take such a short amount of time, and can be ready in a snap for a quick fun Halloween treat!